The first elephant to America. 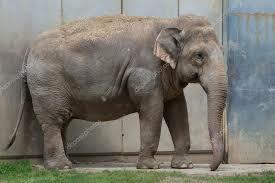 It was of course an Indian elephant like the one pictured above. It came on board the ship "America" that landed in New York harbor. It's dubbed the Crowninshield Elephant after Jacob Crowninshield, the merchant who purchased it. Here is how he describes the event: “We take home a fine young elephant two years old, at $450.00. It is almost as large as a very large ox, and I dare say we shall get it home safe, if so it will bring at least $5000.00. We shall at first be obliged to keep it in the southern states until it becomes hardened to the climate." A few interesting sidebars: On the voyage home was the father of the future author of "The Scarlet Letter" Nathaniel Hawthorne. The ship docked at the island of St. Helena, where Napoleon would later be exiled for good. 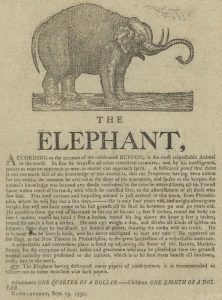 And George Washington entered in his Philadelphia account book the expense of seeing the premiering pachyderm on November 16, 1796.